Dexter Daily: Rewatching Dexter - 3.07 "Easy As Pie", 3.08 "The Damage a Man Can Do", 3.09 "About Last Night"
Rewatching Dexter - 3.07 "Easy As Pie", 3.08 "The Damage a Man Can Do", 3.09 "About Last Night"
Rewatching Dexter by DexterDaily. A look back at the past seasons of 'Dexter' and our favorite serial killer's victims. Today, we're going to remember episodes: 3.07 "Easy As Pie", 3.08 "The Damage a Man Can Do", 3.09 "About Last Night". Hit the 'read more' button for more! 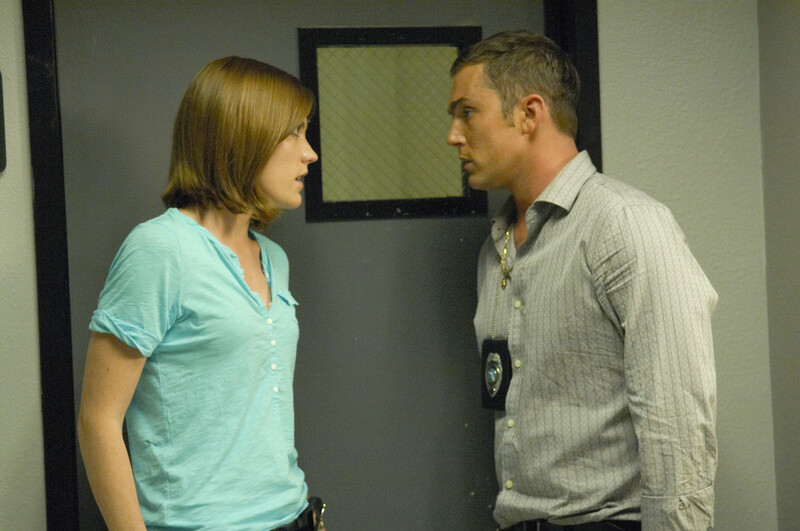 Miguel offers Dexter a new potential victim, but after properly vetting her, Dexter isn't sure she fits the Code. 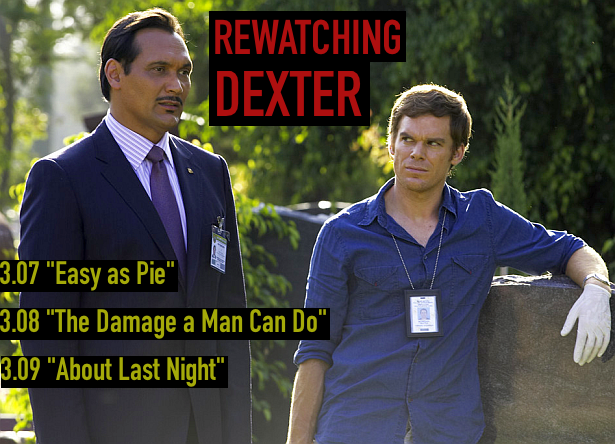 When he informs Miguel of this, he reacts with anger, making Dexter believe the new friendship is in danger. An old sickly friend of Dexter's, Camilla, reinforces this idea, when she asks Dexter to help end her life, insisting she would never ask a friend to do something against his conscience. Meanwhile, Rita finds out that Sylvia is beginning to suspect her husband, Miguel, is having an affair. Debra ends up revealing to Anton that he is being used as bait to lure the Skinner, forcing her to find new way to find the Skinner. As a result, Anton realizes Debra cares for him more than he thought. Dexter's victim: Mercy killing, at her request: Camilla Figg. Fed poison key lime pie. Miguel brings Dexter another "project," but this time he wants to get his hands dirty. Dexter realizes it's time to teach Miguel the Code — for his own safety as well as Miguel's. As Dexter walks Miguel through the process, Dexter both struggles with, and enjoys, letting Miguel into his private world so completely. But Dexter doesn't realize that this has only whetted Miguel's appetite. Rita finds herself losing control because of the pregnancy. She becomes worried that Dexter may get fed up with her. Because of her hard work, Debra finds herself one step closer to catching the Skinner. But after she finds out a secret about her new boyfriend, Anton, he disappears on her. Dexter starts to fear that Miguel may have strayed from the newly taught Code. This concern starts to put a strain on their friendship. And Dexter doesn't get a reprieve from this at Rita's either. Sylvia, noting how Miguel is never at home anymore, tells Rita that she is now convinced that Miguel is having an affair. Rita decides to confront Miguel about his indiscretions. Meanwhile, Anton is confirmed to have been taken by the Skinner, sending Debra into a furious search, not only for Anton, but also for his potential killer.